Nesting dolls are wonderful creations that never fail to make children smile. Whether made from wood or plastic, these whimsical toys provide fun and fascination. Although these toys, which originated in Russia, are traditional, our assortment of nesting dolls are highly contemporary. Featuring cute and charming designs and characters, these dolls are perfect for children. Place one on a shelf as a decorative feature for your child’s bedroom or nursery. Alternatively, let it join your child’s toy collection and watch them have hours of fun stacking the dolls together and taking them apart again. OMM Design Matryoshka Animal Nesting Dolls OMM Design Matryoshka Animal Nesting Dolls characters have been created by Ingela P Arrhenius, a freelance illustrator based in Stockholm Sweden. These nesting characters display her signature retro charm and bold colours. 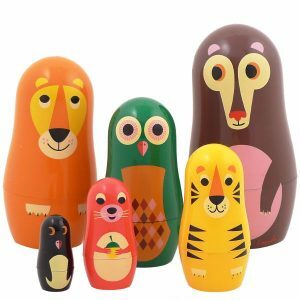 The nesting doll set contains 6 animals that fit into one another - monkey, lion, owl, tiger, seal and a penguin. The OMM Design animal nesting dolls are designed to be played with or placed on display. Made from BPA free plastic. Largest character is 12cm in height and smallest is 3cm in height. This nesting doll is not suitable for children under 3 years due to the size of some of the pieces. It is highly recommended they are used as decorative items and if used as a toys it must be under full adult supervision. 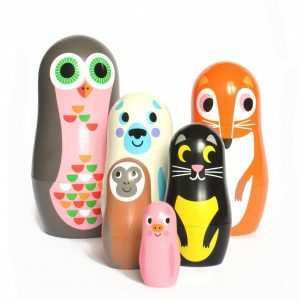 OMM Design Matryoshka Animal Nesting Dolls Series 2 OMM Design Matryoshka Animal Nesting Dolls characters have been created by Ingela P Arrhenius, a freelance illustrator based in Stockholm Sweden. These nesting characters display her signature retro charm and bold colours. The nesting doll set contains 6 animals that fit into one another - owl, fox, bear, black cay, monkey and a little piglet. The OMM Design animal nesting dolls are designed to be played with or placed on display. Made from BPA free plastic. Largest character is 12cm in height and smallest is 3cm in height. This nesting doll is not suitable for children under 3 years due to the size of some of the pieces. It is highly recommended they are used as decorative items and if used as a toys it must be under full adult supervision.